Surrounded by some of the most beautiful Chesapeake Bay shoreline and centrally located in Maryland, Anne Arundel County is in many ways the heart of our wonderful state. What better way to celebrate a gorgeous day by the Chesapeake Bay than with dozens of area wineries, culinary artists and master artisans? Now in its fourth year, Wine On The Water offers a high-end, all-encompassing festival that features a variety of vendors, musicians and attractions. Check out our video footage from 2017’s festival! For more videos, check out our video page. Located in Pasadena, Maryland, Kurtz’s Beach originally opened 83 years ago as a bathing beach. Today, the family-owned and operated venue hosts a variety of events, from weddings to fundraisers to festivals and more. The property boasts outdoor pavilions, a sprawling 10-acre field, a newly renovated indoor facility, a bay-front gazebo/patio area, and more. Kurtz’s Beach is located at 2070 Kurtz Avenue Pasadena, Maryland 21122. To learn more about Kurtz’s Beach visit their website. Cancer touches almost everyone. One in three people will get one form or another. Which is why the University of Maryland Baltimore Washington Medical Center built the Tate Cancer Center in Glen Burnie, Maryland, so that expert care could be given close to home. Named for Creston and Betty Jane Tate, the Tate Cancer Center is affiliated with the University of Maryland Marlene and Stewart Greenebaum Comprehensive Cancer Center, one of the country’s leading hospitals in the treatment of blood, brain, breast, lung and prostate cancer. 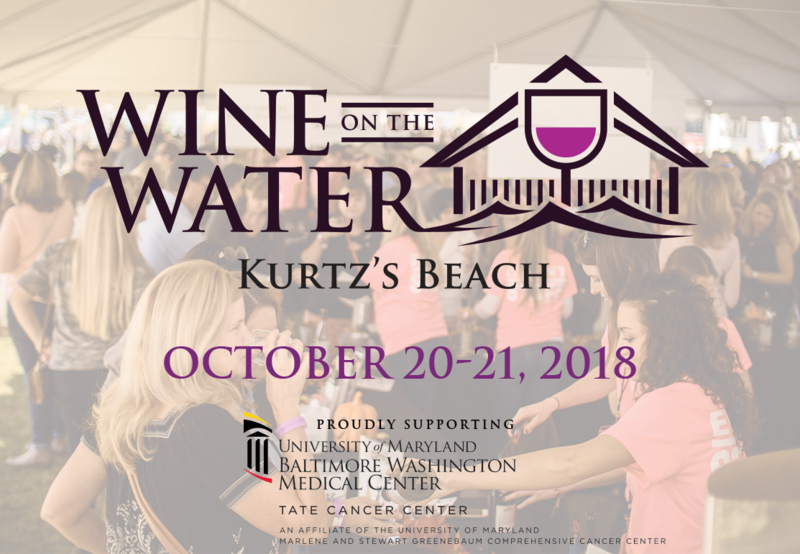 Kurtz’s Beach is proud to support the UM BWMC’s Tate Cancer Center through the Wine on the Water Festival. Please find more information about the Tate Cancer Center at MyBWMC.org/about-tate-cancer-center.